007, SPECTRE and a girl's HERO. Innocently, fragment by fragment, James Bond built up a plan of operations – a plan that would leave him and Lippe alone among the machinery of the sound-proof treatment rooms. For there would be no other opportunity. Count Lippe kept to his room in the main building until his treatment time at noon. In the afternoons he swished away in the violet Bentley – to Bournemouth it seemed, where he had ‘business’. The night porter let him in around eleven each night. One afternoon – in the siesta hour – Bond slipped the Yale lock on Count Lippe’s room with a straight piece of plastic cut off a child’s aeroplane he had bought for the purpose in Washington. He went over the room meticulously and drew a blank. All he learned – from the clothes – was that the Count was a much travelled man – shirts from Charvet, ties from Triplet, Dior and Hardy Amies, shoes from Peel, and raw silk pyjamas from Hong Kong. The dark red morocco suitcase from Mark Cross might have contained secrets, and Bond eyed the silk linings and toyed with the Count’s Wilkinson razor. But no! Better that revenge, if it would be contrived, should come out of a clear sky. That same afternoon, drinking his treacly tea, Bond scraped together the meagre scraps of his knowledge of Count Lippe. He was about thirty, attractive to women, and physically, to judge from the naked body Bond had seen, very strong. His blood would be Portuguese with a dash of Chinaman and he gave the appearance of wealth. What did he do? What was his profession? At first glance Bond would have put him down as a tough maquereau from the Ritz bar in Paris, the Palace at St Moritz, the Carlton at Cannes – good at backgammon, polo, water-skiing, but with the yellow streak of the man who lives on women. But Lippe had heard Bond making inquiries about him and that had been enough for an act of violence – an inspired act that he had carried out swiftly and coolly when he finished his treatment with the Fearing girl and knew, from her remark, that Bond would be alone on the Traction table. The act of violence might only have been designed to warn, but equally, since Lippe could only guess at the effect of a 200-lb pull on the spine, it might have been designed to kill. Why? Who was this man who had so much to hide? And what were his secrets? Bond poured the last of his tea on to a mound of brown sugar. One thing was certain – the secrets were big ones. Bond never seriously considered telling Headquarters about Lippe and what he had done to Bond. The whole thing, against the background of Shrublands, was so unlikely and so utterly ridiculous. And somehow Bond, the man of action and resource, came out of it all as something of a ninny. Weakened by a diet of hot water and vegetable soup, the ace of the Secret Service had been tied to some kind of rack and then a man had come along and just pulled a lever up a few notches and reduced the hero of a hundred combats to a quivering jelly! No! There was only one solution – a private solution, man to man. Later perhaps, to satisfy his curiosity, it might be amusing to put through a good Trace on Count Lippe – with SIS records, with the CID, with the Hong Kong Station. But for the time being Bond would just stay quiet, keep out of Count Lippe’s way, and plan meticulously for just the right kind of pay-off. By the time the fourteenth day, the last day, came, Bond had it all fixed – the time, the place, and the method. Ten minutes later, Bond, blood pressure down to 132/84, weight reduced by ten pounds, osteopathic lesions gone, clear of eye and tongue, was on his way down to the basement rooms for his final treatment. Blofeld completed his inspection of the faces. As he had anticipated, only one pair of eyes had slid away from his. He had known he was right. The double-checked reportshad been entirely circumstantial, but his own eyes and his intuition had to be the seal. He slowly put both hands under the table. One hand remained flat on his thigh. The other went to a side-pocket and drew out a thin gold vinaigrette and placed it on the table in front of him. He prised open the lid with his thumbnail, took out a violet-scented cachou, and slipped it into his mouth. It was his custom, when unpleasant things had to be said, to sweeten his breath. Marius Domingue of the Union Corse, a proud, chunky man with slow eyes, who was wearing ready-made, rather sharp clothes that probably came from the Galleries Barbes in Marseilles, got slowly to his feet. He looked squarely down the table at Blofeld. His big, rough hands hung relaxed at the seam of his trousers. Blofeld appeared to answer his gaze, but in fact he was noting the reaction of the Corsican next to No 7, No 12, Pierre Borraud. This man sat directly facing Blofeld at the far end of the long table. It was his eyes that had been evasive during the meeting. Now they were not. Now they were relaxed, assured. Whatever the eyes had feared had passed. Blofeld looked down the table. His eyes were fixed on the man standing – on No 7. The Corsican, Marius Domingue, looked back at him steadily. He knew he was innocent. He knew who was guilty. His body was still with tension. But it was not fear. He had faith, as they all had, in the rightness of Blofeld. He could not understand why he had been singled out as a target for all the eyes that were now upon him, but Blofeld had decided, and Blofeld was always right. Blofeld noted the man’s courage and sensed the reasons for it. He also observed the sweat shining on the face of No 12, the man alone at the head of the table. Good! The sweat would improve the contact. Under the table, Blofeld’s right hand came up off his thigh, found the knob and pulled the switch. The body of Pierre Borraud, seized in the iron fist of 3,000 volts, arced in the armchair as if it had been kicked in the back. The rough mat of black hair rose sharply straight up on his head and remained upright, a gollywog fringe for the contorted, bursting face. The eyes glared wildly and then faded. A blackened tongue slowly protruded between the snarling teeth and remained hideously extended. Thin wisps of smoke rose from under the hands, from the middle of the back, and from under the thighs where the concealed electrodes in the chair had made contact. Blofeld pulled back the switch. The lights in the room that had dimmed to orange, making a dull supernatural glow, brightened to normal. The roasted meat and burned fabric smell spread slowly. The body of No 12 crumpled horribly. There was a sharp crack as the chin hit the edge of the table. It was all over. Some of the men round the table nodded their understanding. As usual, Blofeld’s reasoning made good sense. No one was greatly perturbed or surprised by what they had witnessed. Blofeld always exercised his authority, meted out justice, in full view of the members. There had been two previous occasions of this nature, both at similar meetings and both on security or disciplinary grounds which affected the cohesion, the inner strength, of the whole team. In one the offender had been shot by Blofeld through the heart with a thick needle fired from a compressed air pistol – no mean feat at around twelve paces. In the other, the guilty man, who had been seated next to Blofeld on his left hand, had been garrotted with a wire noose casually flicked over his head and then, with two swift steps by Blofeld, pulled tight over the back of the man’s chair. Those two deaths had been just, necessary. So had this death, the third. Now, the members, ignoring the heap of death at the end of the table, settled in their chairs. It was time to get back to business. 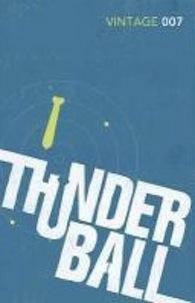 Extract from Thunderball reproduced with permission from Ian Fleming Publications Ltd.